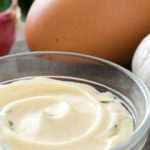 HOMEMADE MAYONNAISE – Lake George Olive Oil Co. In a wide mouthed mason jar, add the ingredients in the order listed above. Let is set for a moment to make sure the egg yolk is settled at the bottom. Place an immersion blender fully at the bottom of the container and start slowly pulsing the mixture. Within a few seconds, you will see mayonnaise start to form at the bottom of the jar. Slowly move the blender up and down to finish forming the mayonnaise. The whole process should take no more than a minute. Scrape the sides of the jar and cover with a lid. Place in the refrigerator and use within one week.